Effects of the viscosity, Earth rotation, and sphericity (beta-effect) on the long-wave dynamics are investigated based on the linear model. The basic equation for the complex amplitudes of gravitational long waves is obtained. It is shown that the viscosity plays a significant role in the long-wave dynamics. Stokes’ layer thickness is the criterion which separates two regimes of long-wave evolution: low viscosity and viscous flows. Two Stokes’ layers occur in the rotating fluid. The thickness of the first approaches to infinity as the frequency tends to inertial frequency. Considering the role of the Stokes’ layer as a criterion of viscosity influence, we can conclude that for the waves of the near-inertial frequency, viscosity always plays a significant role irrespective of ocean depths. The beta-effect leads to the planetary drift velocity occurrence in the equation. The planetary drift velocity can have either eastward or westward direction depending on the wave frequency. Thus, Earth sphericity causing the planetary drift plays a major role in the asymmetry of the eastward and westward directions in wave dynamics. Friction is another reason for the asymmetry of the eastward and westward directions in wave dynamics. Damping decrements of the westward and eastward waves differ with the biggest difference for waves with the near-inertial frequencies. Group velocities of eastward and westward waves are nonsymmetrical too. Moreover, in a certain range of the near-inertial frequencies, group velocities of both westward and eastward waves are directed exceptionally eastward. 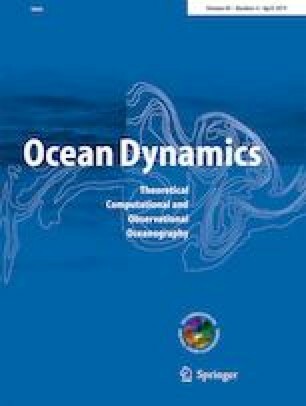 Thus, the beta-effect and fluid viscosity can be the reasons for the asymmetry of western and eastern bays in the tidal wave dynamics. The authors are grateful to the anonymous reviewer for the detailed analysis of our paper and very useful comments and discussions. This work was supported by the Russian Foundation for Basic Research (RFBR project 16-05-00209 А).